Somewhere over the rainbow, way up high, there’s a land that I heard of once in a lullaby. 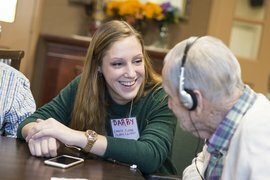 Music and voice major Jessica Voutsinas ’18 was singing the classic song “Over the Rainbow” to a resident at Longview—an adult residential facility near the Ithaca College campus—when the woman unexpectedly lit up and began telling stories about her life and children in a breakthrough of memory recall. Voutsinas started visiting Longview as part of a new course at Ithaca College called Exploring Music as Medicine, which teaches students how to perform for dementia and Alzheimer’s patients and then assigns them to local nursing homes to bring music to residents. Since the launch of the program, dozens of patients in Tompkins County have experienced its benefits. Ryan Mewhorter ’19, a voice and performance major, was introduced to the idea of the healing power of music when he heard School of Music dean Karl Paulnack speak about the program at the beginning of his first year at IC. Having lost his grandfather to Alzheimer’s disease, Mewhorter immediately wanted to become involved in the project. By his second semester on campus, he had founded a student organization called Healing through Musical Companionship. The club now has 50 members who visit Beechtree Center for Rehabilitation and Nursing in downtown Ithaca each week to play recorded music for patients. Using recorded music allows students who are not musicians to help trigger residents’ memories and encourage positive emotional responses. During her first visit to Beechtree in February 2016, club member Kathryn Kandra ’19 met a woman who was slumped in her wheelchair, head tucked down toward her lap. Kandra began playing the show Annie on an iPod, and within minutes the woman started singing along and conducting the music. Halfway through act one, she began asking Kandra about her life at Ithaca College. Mewhorter also loves bringing that feeling to Alzheimer’s and dementia patients, although he found that the live music program through the music course allowed him to make a more direct connection with residents. Seeing the incredible enthusiasm for both the Exploring Music as Medicine course and Healing through Musical Companionship club has sparked talk of expanding the programs. Dean Paulnack says it is possible that the School of Music may consider creating a major or minor in music as medicine that would emphasize both a high level of musicianship and the healing power of music. The program would involve the departments of music, recreation and leisure studies, gerontology, speech-language pathology and audiology, occupational therapy, and writing.